There were serious doubts at Nou Camp as to how Barcelona's new signing from Sevilla, Ivan Rakitic, would fit in amongst the likes of Messi, Iniesta, Xavi, Neymar & co. But the 26-year old Swiss-born Rakitic has put those fears to rest. Not for nothing did Barca pay a reported sum of 20 million Euros for Rakitic. He finished a three year stint with Sevilla in glory. More than the 27 goals he scored for his club, it was a pivotal performance at the UEFA Europa League final against Benfica that earned him a pride of place in the club's annals. Sevilla defeated the Portuguese club on penalties in Turin to take the Europa cup. Rakitic's amazing assist to Bacca in a memorable 2-1 La Liga win against Real Madrid in March 2014 is part of Sevilla folklore. Since his advent into Barcelona in June 2014, Rakitic has proved his worth by matching up skill-wise to Messi & Co. He showed his mettle in a 6-0 win in a pre-season friendly against HJK Helsinki in which he made two assists. His impact was felt in his official debut for the Catalans in a La Liga encounter against Elche where a long ball from him was converted into a goal. Barca won that match 2-0. His first goal for his club came against Levante in a 5-0 away win. His header from a Messi cross was his second in a match against Granada which the Catalans won 6-0. Rakitic has contributed brilliantly to Barcelona's mid-season revival that witnessed an eleven-game winning streak for the club. He has combined and blended wonderfully with the attacking trio of Messi, Suarez and Neymar. In fact, the only two matches that Barca lost, those against Real Sociedad and Malaga were the ones in which Rakitic stayed away. Rakitic's ability to excel in spaces, make vital passes and take unexpected shots on targets have made him a key component in Barca's midfield gameplan. He has adapted himself well to the Catalan's style of play, a distinct departure from the very direct style associated from his days as a Sevilla playmaker. He now tops the La Liga with 87 per cent accurate passes which is a huge improvement from the 44 per cent of last season and is surprisingly turning out to be a true exponent of Barca's tiki-taka style of play. His 25th minute goal against Granada on Sunday, his fifth for Barcelona and an assist in a 48th minute Suarez goal helped the Catalans win the game 3-1 and come within a point of Real Madrid in the La Liga sweepstakes. 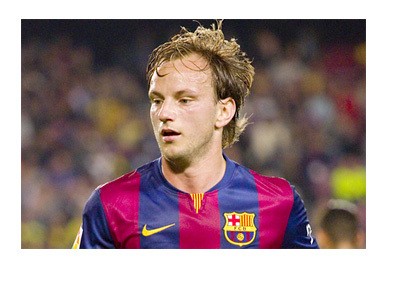 Ivan Rakitic is surely here to stay for Barcelona.